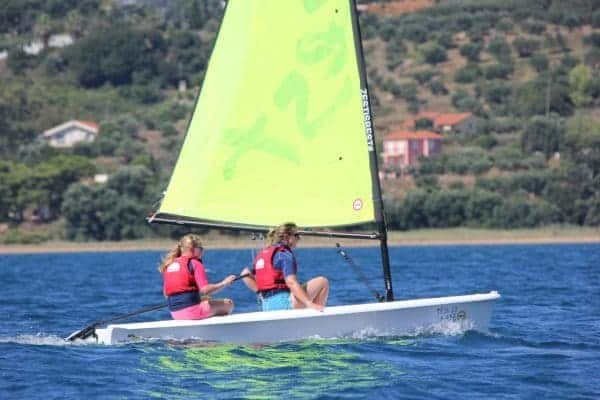 We offer an incredible Dinghy Sailing Holidays, and both our active Beach Clubs in Greece are the ideal locations for both beginner or expert sailors. 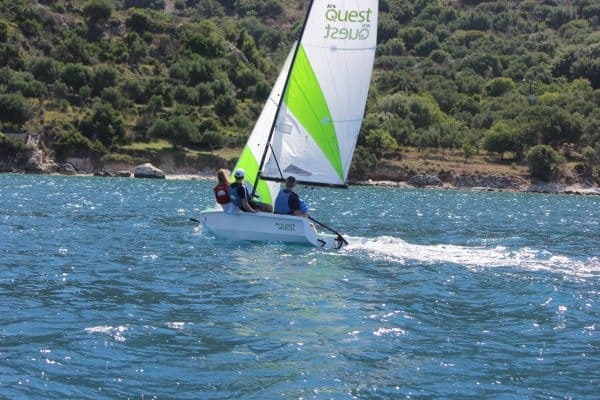 Our clubs are well equipped with a selection of dinghies and catamarans for all abilities and our friendly RYA qualified instructors offer group or personal tuition to suit your specific needs. Because we have the fantastic sailing areas virtually to ourselves, both our beach clubs are very safe and really inspire confidence. Reliable cross shore winds, well maintained equipment, safety boat support and friendly instructors all help in providing that perfect dinghy sailing holiday. Expect cross shore wind conditions. Morning light southerly breezes switch direction over lunch and north westerly winds build in the afternoon for more exciting dinghy sailing conditions. If you can sail a dinghy and have already attended our compulsory safety briefing you possibly don’t need to have a lesson. Head out onto the water whenever you like. All the kit is rigged and ready to go, just grab a buoyancy aid, choose your boat and our friendly beach team will set you off. As part of our beach club holiday package we offer inclusive daily clinics (group tuition sessions that last 2-3hrs). Beginner classes early on in the week lead to more advanced lessons as the holiday goes on. Our instructors talk you through the theory of dinghy sailing, run land and water demos, and get you out on the water as much as they can and as quickly as possible. 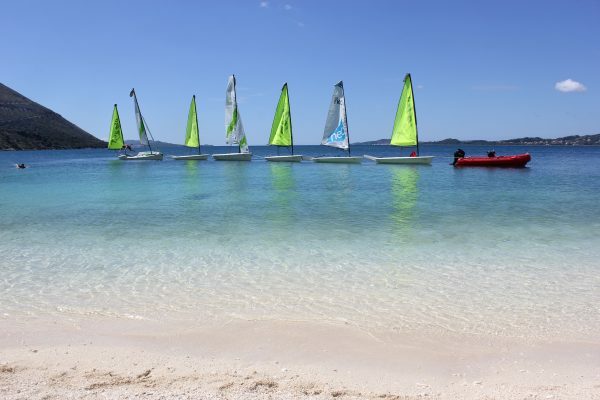 On a beach club holiday we focus on the basics of dinghy sailing in a relaxed environment and in a stunning location. As part of the inclusive group clinics we’ll cover the following over an inclusive 2hr session. Safe sailing – the basic rules of safety in dinghies, including shallow water capsize drills so you can be confident in the water. Rigging of equipment – Correct rigging and sail reefing is important to learn and really helps feeling comfortable on the water. Turning around – Known as Tacking and Gybing – it’s much easier than it looks. 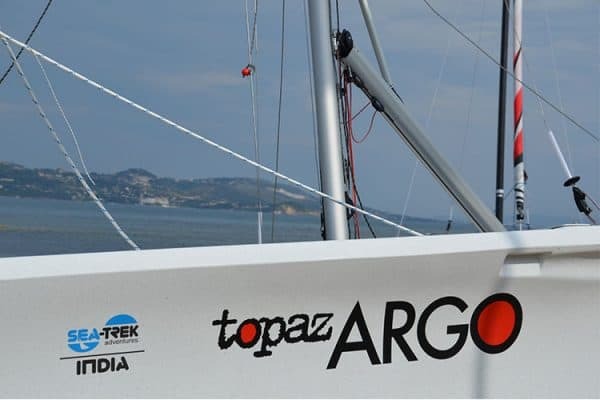 If you can sail a dinghy around a triangular course and tack and gybe this is for you. 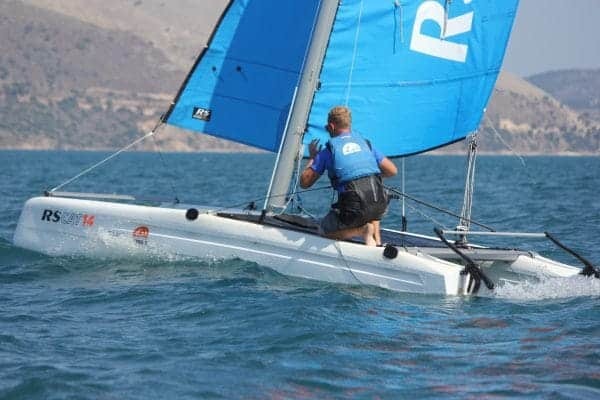 Boost your confidence by dinghy sailing in moderate winds and learn intermediate skills that will help improve your overall technique. As we pretty much have the dinghy sailing area to ourselves, it’s a really good stress-free environment to practice these intermediate skills. Breezy afternoons and cross/cross-offshore conditions at both our clubs really help too. As you’re out on the water the majority of the coaching takes place from the support boats. We offer specific advanced clinics for experienced dinghy sailors looking to improve their skills. Flying spinnakers, roll tacks, using a trapeze, race techniques and trim are some of the more advanced techniques we’ll aim to cover. Everyone loves a race, and everyone can get involved in our weekly regattas. 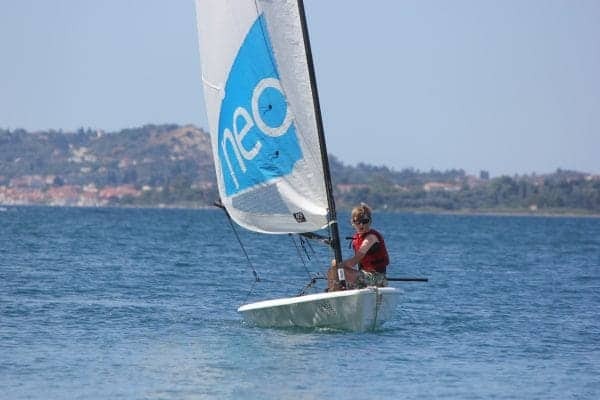 We hold the infamous Dinghy Sailing Regatta at Lixouri and Paliki beach clubs at the end of the week. Sign up, choose your weapon and race around the set course. As part of your sailing holiday in Greece we offer amazing day excursions using the dinghies from our Lixouri Bay Beach Club, kind of like Swallows and Amazons but without the raincoats. Set the sails on our fleet of brand new RS dinghies and after a leisurely hop across the Ionian bay discover the hidden cove known as “Pirates Bay”. Throw in a support boat, some friendly beach staff and an ice box stuffed full of cold drinks and you may well have found the highlight of your beach club sailing holiday in Greece. We pride ourselves on having great kit that is regularly updated. Here are some of our current dinghies we have in resort.